I started running yoga classes twice a week at Satoyama Design Factory. Today nobody showed up, so I decided to combine my yoga practice with some much needed floor maintenance. 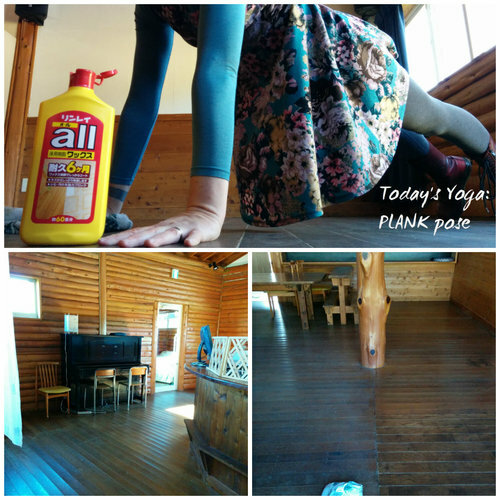 It's amazing how many yoga poses you can do while cleaning the floor. I extended my usual 45 minutes to nearly 3 hours as I swept, mopped, steamed and waxed the wood floors in the main space. In the lower right picture, you get a before/after glimpse. Still not perfect, but much improved. Maybe next week, I'll do window yoga!